This weekend my husband and I got a sitter, jumped in the car, and drove out of the city. We looked at houses and we dreamed. We talked. We laughed. We ate lunch without having to stop mid-bite or mid-sentence to correct behavior, give bites, or wipe up spills. I stay at home, so my days are spent taking the girls to preschool and activities, going to the gym, cleaning, playing with the girls, reading to the girls, teaching the girls, cooking, baking, writing, and did I mention cleaning? It's a busy season and our time is so short. And I work so hard and when my husband gets home we rush through dinner and baths for the girls and we collapse on the couch before doing it all the next day. These are good things. But I'm tired. And I've been so weary from doing things that benefit our family, that I have forgotten how much I love them. How fun they are. And how when he walks with me and holds my hand my heart flutters and I smile. We desire to live in an intentional life. We chose to transplant our family to the city. We picked a neighborhood that at one point boasted the most diverse zip code in the country. We did it all on purpose. We wanted to be used. And now we consider a life lived in the suburbs. It might be the best thing for our family, for our girls (not sure, the jury's still out). But I feel push back, and I think it's from a lifetime of being preached to about the importance of sacrifice. Of being reminded that the harvest is plenty and the workers are few. And I don't want to discount that. Really, I don't. But I am tired. So tired. I have spent years pushing myself to serve more and more. And I've spent so much time working for God that I have forgotten how much I love Him. How fun being a part of His Kingdom can actually be. And how when He walks with me I experience a deeper peace and purpose and I smile. We talked a lot this weekend about purpose, and what it looks like to serve God, and sacrifice. And as we talked I realized that I don't have anything left to give. That after the years of service somewhere along the way I started doing it in my strength, out of obligation, and that now I have nothing left to give. I've come to the end of me. And I think that's okay. God wants to be with you because he loves you. And I recently felt a peace wash over me. And the stress that resides in my shoulders and jaw began to leave and it was as if the windows were opened and a sweet spring breeze began to blow right through my house and into my soul. I could feel my spirit begin to soar. My pastor and friend tells me how the first thing she prays each morning is, "God, show me today what You are doing and let me be a part of it." And those words sound so sweet as I inch toward the hem of His garment. And I don't have to rush rush rush. I get the opportunity to partner with, to be with, to journey with. This is my freedom song. This is my freedom song. This is allowing the Holy Spirit to breathe through me. To give me times of rest and times of action. Not on my schedule but solely on His. To grab the hand of my Creator and follow Him each and every day, wherever that may lead. It may be finding a patch of green grass to play on with my girls. It might be marching along with other Christians as we beg a city to stand up against violence. It might be rocking babies in the nursery. It might be writing out words on a computer, telling of my brokenness and His rescue. I don't know what It will be, but I know I'll be singing out my freedom song with a smile on my face. I hope you are singing along with me. To God be the glory. On Thursdays we gather together at Imperfect Prose to celebrate redemption. I'm so blessed to be a part of this amazing group of writers and artists. Want to join us and write it out? Link up a post (old or new) that relates to redemption or something "imperfect." Put the "Imperfect Prose" button at the bottom of your page so others can find their way. Read and encourage each other along the way! there is such a difference between a small god who needs to use us, needs us to be perfect in our obedience, needs us to speak for him and needs and needs and needs and a Big God who just wants to love us, isn't there? 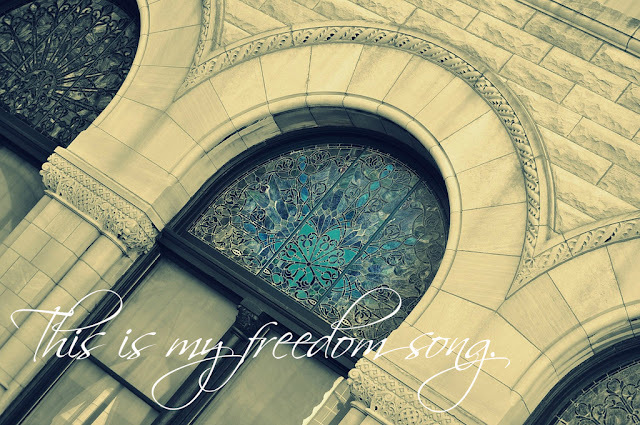 when i'm tired of the fighting and the wars of words and the conflict (external and internal) i say that theology doesn't matter -- but i know after reading your freedom song that it does. oh, it does so much. because we become like what we serve. and a needy, frustrated, limited god produces people filled with much angst, expectation, and fear. i have been there. sometimes i still am there. but this freedom you describe . . . ya know, it's more like falling in love than military service, isn't it? that's why it's so freeing, i think. and i love that you wrote about it, Brenna. love that you are tasting the new wine. cheers. You can serve God everywhere. Suburb, city, grocery store, everywhere. I love the Sarah Bessey thoughts on God. I hadn't ever heard it that way. I think sometimes we have to get thoroughly disgusted and exhausted with our own efforts of doing, in order to experience freedom in being. At least that is how it works for me. And you said it well here, what so many of us experience in Christian service. He just wants us to experience lavish love doesn't He? Thankful you found it, you wrote about it. Friend, this breathes freedom, release, renewal, and peace...such peace. Thank you Brenna for revealing these truths that have been revealed to you in love. That love is the greatest, the best, the one that covers and casts out. This God of ours who is a lover of our souls and relationship with us IS love. I hear such beautiful peace in your voice. Love to you, sweet one. May you walk out your days in His arms, trusting and abiding in His love. I think the fact that you have wrestled with this question of where you should be so deeply will ensure that wherever you live you will be open to what God is doing in that neighbourhood, ready to be his light and his love to your neighbours and friends, whether their intercity, multi-cultural neighbours, or suburban mono-culture neighbours. In the end, there's need everywhere and there's beauty everywhere. I'm so glad you have found freedom in this decision! those words from Sarah were in my heart this week, too. what a blessing and a beauty you are, dear sister. How crazy is it that we can go forever looking intently at the forest that looms before us and never see the trees that are, literally, right before us? And how beautiful and unique those trees are and we must tend to them first, or we lose the forest. But we forget this. Again and again, we forget this. Praising the beautiful Spirit wind that is rushing through your veins, filling out places that have grown weak from toiling, giving you a hope and a future. Praise be to the Holy one, dear friend. I loved this post. I think I've gotten a bit weary myself and needed this reminder. I'm grateful.